This review contains moderate spoilers for Return to Oz. The land of Oz has received a lot of different interpretations since the days of L. Frank Baum’s original novels. From the technicolor dreamland of the film starring Judy Garland to the urban-style play The Wiz to Gregory Maguire’s Wicked series, Oz has been seen in literally dozens of different ways. But never has it been so creepy as in Walter Murch’s “sequel” to the original film, Return to Oz. Return to Oz, which was released in 1985 by Walt Disney Pictures, starts six months after the twister that brought Dorothy to Oz in the first place. Dorothy can’t sleep, and when Uncle Henry and Aunt Em see an ad in the paper for “electrical healing”, they decide to bring Dorothy to Dr. Worley to be “healed”. However, a massive thunderstorm blows in just before the doctor can use the machine, and a mysterious blond girl “rescues” Dorothy. They run, fall into a river, and Dorothy manages to crawl into a wooden crib and save herself. The next morning, Dorothy wakes up in the middle of a desert with only her pet chicken Billina for company (Toto was back on the farm all this time). To her surprise, Billina can talk. This clues Dorothy into the fact that she’s back in Oz. With the sassy-talking chicken, Dorothy makes her way to what’s left of Munchkinland — which amounts to nothing but her old house. She finds a nearly-destroyed Yellow Brick Road and follows it to the Emerald City, which is bereft of gems and full of stone statues. Eventually Dorothy adds Tik-Tok (the Royal Army of Oz) to her retinue, and they find out that Princess Mombi, not the Scarecrow, is in charge now. But her boss is a much more evil individual, the Nome King, who has captured the Scarecrow. Dorothy decides she must rescue him, and in the process eventually joins up with Jack Pumpkinhead (a wooden man with a pumpkin for a head) and The Gump (the head of a moose with the body of a sofa and wings made of palm fronds). Watching Return to Oz almost thirty years after its release, I found it to be a very dark film, full of scary images, creepy animatronic puppets, and 31 severed heads. The villains include a nurse dressed like a crow, a princess who took the heads of beautiful women to use herself, creatures with wheels for hands and feet, and a king made of stone who uses other people to make him more human. Plus, in this film Dorothy is only about eight or nine — the actual age of the character in the books, instead of the teenage girl from the original film — and the first thing she must overcome is an electroshock therapy machine. Fortunately, the doctor who’s going to use it is rather kindly, but his head nurse and orderlies would be extremely frightening, especially for a girl born in the 1890s. The film stars Fairuza Balk (The Craft, American History X) as Dorothy. It’s her first feature film role, and although she seems a little stilted in the beginning, she grows into the role and is pretty believable by the time she has to face the Nome King. Nicol Williamson (Excalibur) plays the doctor and the king (depending upon if you’re in Kansas or Oz), and he does an admirable job being a kindly doctor in one and an evil, somewhat crazy king in the other. Piper Laurie (Carrie, Twin Peaks) and Matt Clark (The Jeff Foxworthy Show) are Aunt Em and Uncle Henry. However, the most notable human character in the film is Princess Mombi, played by Jean Marsh (Upstairs, Downstairs, Frenzy). Mombi, a vain sorceress who mostly sleeps and plays the lute, has collected the heads of the thirty most beautiful women in Oz and interchanges them depending upon her mood. She also portrays Nurse Wilson from the hospital Aunt Em brings Dorothy to, and she is most definitely not nurturing. She rarely smiles, dresses in all black, and when Dorothy escapes, she sweeps after her like a predatory bird. The other stars are mostly puppets and animatronics, although they include Deep Roy as the Tin Man and Brian Henson as Jack Pumpkinhead. David Shire, who up to that point had mostly composed television music (and also 2010: The Year We Make Contact), was responsible for a score that was better when it was slow than fast. Of course, a lot of the film moves slowly — when we’re not in the middle of an action sequence — so he has time to shine. Unlike the original Oz film, which was based mostly on Baum’s original The Wonderful Wizard of Oz novel, Return to Oz primarily draws from The Marvelous Land of Oz and Ozma of Oz, along with Tik-Tok of Oz for its eponymous main character. According to an interview with director Walter Murch, the film itself almost didn’t happen when Murch was fired by Disney. However, George Lucas intervened on Murch’s behalf and that kept him on the project until its completion and release. 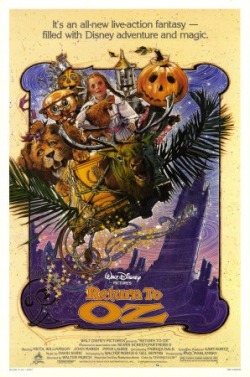 The poster for the film looks relatively innocuous (I put an image of it above), and it has the tagline “It’s an all-new live-action fantasy — filled with Disney adventure and magic.” The poster does have the Scarecrow, Tin Man, and Cowardly Lion, even though only the straw man actually has any lines. Overall, the film was pretty dark, especially for a Disney movie, and in fact a documentary in 2007, The Joy That Got Away (which you can watch in its entirety online), examines the film itself and Oz fandom in general, including the genesis of this rather dark tale. I vaguely remember seeing Return to Oz in theaters as a child and deciding that the movie was good, but scary. As an adult, I’m quite surprised at how creepy and disturbing the film’s imagery was. In Oz alone, we have the insane behavior of the Wheelers, the mirror-palace where Mombi resides, and even the Gump, who should’ve quit while he was a head. Back in Kansas, there’s storms, desolate landscapes, and an electroshock therapy machine. In fact, even the ending is a little weird, with its overblown colors and the portrayals of the Scarecrow (who looks really peculiar) and the Cowardly Lion (an animatronic who looks even less lion-y than the one played by a human in the original film). I still think the film is good, though — I enjoyed watching it, even now, and it kept my attention and interest throughout. However, I personally wouldn’t recommend watching it with your younger kids. It’s a little too creepy for them — although, given how early kids are watching PG films these days, maybe a five-year-old could handle this. Note to Parents: This film contains disturbing imagery and general creepiness, but nothing overly violent and no adult language or situations. Of course, you should use your own discretion when it comes to your children.